With it's lightweight design, row of hot keys and back lighting for the keys, the Flexiglow Illuminated Multimedia Keyboard may be just the ticket for the person on the go. Input power - 5V +/- 5% 250mA. Keyboard cable - 180cm long. Fully compatible with Windows 98/Me/2000/XP/NT. 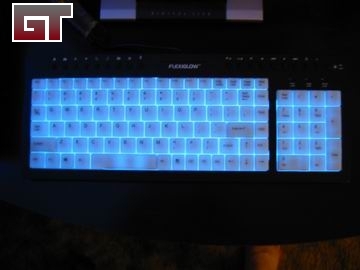 Electro-Luminescent lighting panel that illuminates the translucent keyboard keys. 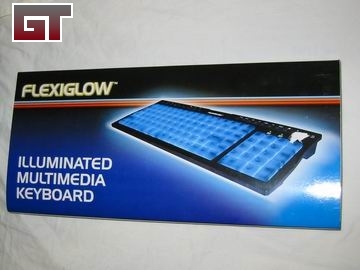 The major selling point of this keyboard, as well as any Flexiglow product, is the obvious 'glow'. 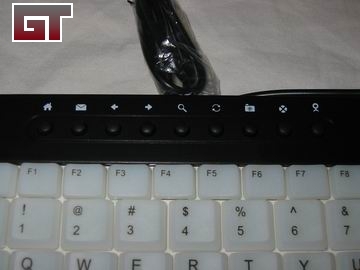 With a very light blue EL light under the keys, the keyboard provides a non-blinding light when used in the dark. The keyboard comes in either a black or white housing. 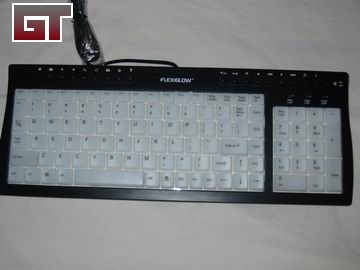 A single sheet listing all the hot keys and a driver disk are included in the package. The keyboard is very compact. Most of the keys are easily accessible, except for the backspace. The one on this keyboard is small, which often times made me hit the key by accident. The Home, Insert, End, PgDwn, PgUp and Del keys are positioned vertically as opposed tot he rectangle configuration most people are familar with. A note for Windows XP users, you do not need to install the software. All the hot keys function just fine without them. There is an on/off switch for the light at the top right corner. The browser buttons control the home, email, back, forward, search, refresh, favorites, stop and media functions. 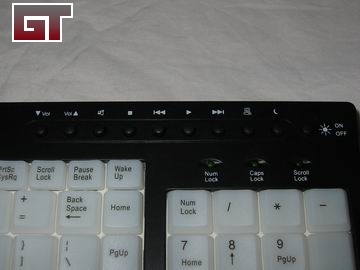 The media buttons on the right side control the volume up, volume down, mute, stop, previous, play/pause, next functions. There is then the My Computer and sleep buttons to the left of the on/off button. I noticed that the Scroll, Num and Cap lock LEDs do not match the blue since they are green. It would have been nice if they were blue or even white to go with the color theme. The hot keys work perfectly in Windows. I was able to control Internet Explorer functions as well as Windows Media without a problem. The keys are soft and rather quiet during use. The faint blue light is easy on the eyes which is great when in the dark. One thing to note, the back light does not turn off by itself. To preserve your EL panel, you will need to turn it off manually. Overall, the keyboard is a good value as long as you can get around the compact key layout.